This page, written by Dave G3YMC, describes our 2005 entry in NFD – though you will see that little has changed from previous years. This year’s contest we again decided to enter the low power 10W section with a totally battery powered station. It was again marred by poor conditions on the higher frequency bands, but that was compensated with excellent conditions on the low bands and we increased our score over that in 2004 and exceeded our expectations. 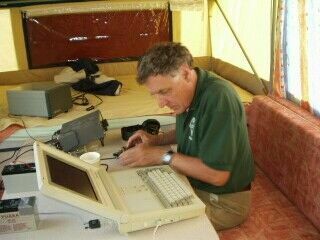 Since Ian G3TLH moved from the area a couple of years ago we have been short of CW (morse) operators for this event. Only G3YMC and John G3NCN were available, as Maco M0WXO who had joined us last year had other commitments and so it had to be a two operator event. This problem of a shortage of operators is unfortunately being experienced by many clubs like ours. 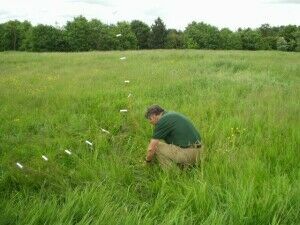 Our normal site at Longhill Park, used for our previous entries, was available and is very convenient. It is a public area and some interest from members of the public was expected, always good publicity for amateur radio. The station again was based on an Elecraft K2 transceiver. I had suggested that we used John’s, only because we had always used mine in the past. However as you will see later, it became necessary to use my K2 instead. The antenna was unchanged – a 204ft inverted vee doublet at 30ft supported with John’s lightweight aluminium mast. Power for the K2 would be 7AH gelcells, we had two of these which would be more than adequate for our 12 hour participation. Logging was intended to use my Toshiba 386 laptop powered off the trailer battery with EI5DIs Super Duper logging software. As in previous years the antenna was fed centre fed with home made open wire feeder and fed with a switchable 1:1/4:1 balun – this was then matched with the internal automatic ATU inside the K2. It was fed with open wire feeder – the spreaders are made out of readily available and cheap electrical conduit, a techique I have used for many years and does not seem to be used elsewhere – see the photo. Use of the K2 ATU in conjunction with computer linking to the laptop via its serial link makes instantaneous band switching possible, almost essential in today’s amateur radio contests. It would also allow us to check the 10m band at frequent intervals for possible short lived sporadic E openings, in practice this year it was more useful for quick switching between the three lower bands. As in previous years we decided to operate the 12 hours allowed in the Low Power section in the first 12 hours. This was convenient for us, as both myself ad John have church commitments on Sundays. With recent experience of conditions on the hf bands it was decided to delay starting till 1600z which woould hopefully allow us to take advantage of any dawn lift on 40m by operating to 0400z. Further from our experience in previous years, and in view of our slightly delayed start time, we decided we did not need to get on site until 3.30pm. This would give us plenty of time to get the station erected and on air. We were joined by David 2E0XDF (who took some of the photos) and for a short time by Mike G4DDL and Graham G4DDN who were out on a cycle ride. 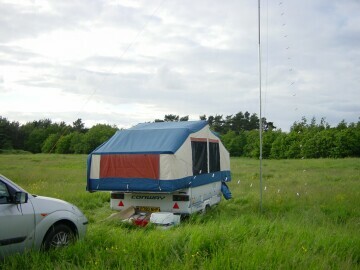 The camping trailer and antenna was soon erected. When we came to connect up the station it became apparent there were a couple of problems with John’s K2. Firstly the sidetone level was very low and hard to hear. We could live with this by the use of headphones (and we have an headphone adaptor to allow simultaneous use of a speaker and phones). The second problem we a little more serious – it refused to talk to the laptop over the serial link. This would make band changing more problematic and errors in the logging might result. I quickly connected my own K2 up instead and all was well again. Because of the problems with the K2 it was in fact 5.15 local (1615zs) by the time we were ready to get on air, but no problem as we could finish a quarter of an hour later. So off we went into the action. A quick check showed that 10m was dead (and it remained that way throughout the contest) and 15 was not that much better. So down to 20m, and a long list of Russian portables with very similar calls. We were off! This is a general view of our operating position, with John G3NCN on the key. The rig is powered off the 7AH battery in behind the laptop. The old laptop is of course very much larger than today’s models! At 5.15am we pulled the switch, having done the 12 hours allowed in the low power section. The station was soon dismantled and packed away, and we drove off site around 6am – to the surprise of a bleary eyed chap who had decided to sleep in the car park! The log was prepared and emailed to the adjudicators, and some photos prepared for the club newsletter which was to be published that day. All done for another year. In fact in 2006 we won’t be doing NFD. It is the 50th anniversary of Bracknell Methodist Church (our club meeting place) that weekend and I shall be pretty busy with the arrangements for that. BARC will be on the air from that event on Saturday June 3rd with our club call, GX4BRA. This is a significant increase on our 2004 score and our highest score yet in this section. In general we are pleased with the result. It would have been nice to have been able to work more stations on 10m and 15m but the propagation was just not there. It was more than compensated by an excellent QSO rate on Top Band. It remains to be seen where we are placed in the results. In the published results which appeared in October RadCom we found that for the fourth year in a row we are yet again in second place. This year we were beat by the Reading club who achieved a comfortable lead with 2016 points. For some reason first place seems as far from reach as ever!